Trikatu Churna is an herbal formulation used in ayurveda for enhancing effects and increasing the absorption of ayurvedic medicines. It has hot potency, which means its intake results in production of heat in the body and increase digestive juices and bile salt secretion. Trikatu Churna contains following three ingredients in equal amount. Trikatu Churna has following healing properties. 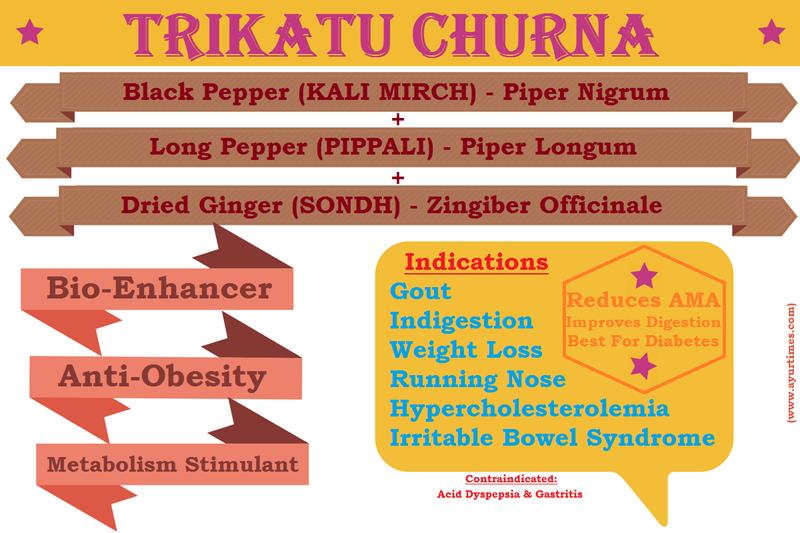 Trikatu Churna is helpful in following health conditions. Trikatu Churna has primary effect on stomach and increases digestive juices, which helps stimulating digestion. It also has influence on liver and increases production of bile salts. It stimulates secretion of bile from the gall bladder. It also stimulates pancreas functions. Therefore, it affects overall digestive system. Trikatu contains PIPERINE, which is a great bio-enhancer phytochemical. It promotes the bioavailability of nutrients and other medicines including both ayurvedic as well as modern drugs. However, Trikatu Churna may not have synergistic effect with other drugs, but increases the absorption of the drugs in the blood stream. It is helpful for those medicines, which are poorly absorbed in the blood stream. Almost all ayurvedic medicines contain Trikatu powder due to three main reasons. Therefore, Trikatu churna is an essential ingredient in all types of ayurvedic remedies. Trikatu also improves and potentiates the action and functions of mineral-based medicines. However, Trikatu churna is not appetite suppressant. Many places have wrongly described Trikatu as appetite suppressant, which is clinically as well as theoretically wrong statement. But it reduces body weight by acting on the root cause of obesity. According to ayurveda, there are seven main tissues (DHATUS) and Fatty Tissue (MEDA) is one of them. Each DHATU plays a crucial role in formation of other DHATU. Blood (RAKTA) plays a role in accumulation of fat. The fatty acid concentration in the blood increases after having a meal. Insulin released from the pancreas stimulates the uptake of fatty acids in different cells of the body including fat cells, liver cells and muscle cells. In ayurveda, this process is taken under action of BHOOTAGANI, which helps in metabolic transformation. Thereafter, there will be two main fates of metabolic process. One is utilization of fats and second is accumulation of fat in the body. Mostly body should use the fatty acids and should not accumulate the fat more than reserved fat amount in the body, but in obese people, it does not occur. Body accumulates the fat more than its requirement. As per ayurveda, it occurs due to errors in metabolic transformation. Fatty Tissue (MEDA) should play role in formation of bones. Generally, polyunsaturated fatty acids including linoleic acid and alpha-linolenic acid helps in bone formation and reduces reabsorption of the bone minerals. Here, you may have observed many obese people with low bone mineral density and weakened bones and cartilages. This is the cause. Trikatu churna acts on this root cause. It improves metabolic transformation and prevents accumulation of fats. Secondly, Trikatu churna also burns accumulated fats by rectifying the fat metabolism in the body and improving metabolic powder. Note: Initially, many patients have reported increase in their appetite after eating Trikatu churna, but you should not eat unhealthy food in such situations. You should eat low glycemic foods, which mostly includes fruits and vegetables several times a day to reduce food cravings. After a few days, you will notice a difference and lightness in the body and naturally decrease in appetite, as your body adjusts with Trikatu. Some experts have called it as false rise in appetite because of increase in metabolic powder of the body, which actually helps burning the fats. Many people have reported body aches with feeling of heaviness in the body, which is generally common in winters. Trikatu powder increases warmth in the body and reduces body aches, heaviness, fatigue, restlessness etc. Trikatu churna is a good cholesterol-lowering remedy. Trikatu increase synthesis of bile acid from cholesterol in the liver. However, it may not block the cholesterol production like modern medicines, but it helps in proper utilization of cholesterol in the body and thus reduces excess cholesterol level in the blood. Trikatu churna has antiviral properties. It is taken with honey to reduce running nose and sneezing in the common cold. It is effective when running nose, congestion, sneezing and body aches are main symptoms. However, if throat is red, irritated and inflamed or if one has dry cough due to irritation in throat, Trikatu is not suitable in such condition. According to our experience, Trikatu is good in first 2 days of common cold. After that, Holy Basil (Tulsi) with some other herbs is more beneficial. All three herbs present in Trikatu churna have bronchodilatory action. It also reduces production of phlegm and chest congestion. Generally, it is used with Pushkarmool (Inula Racemosa) as follows. Modern science yet does not know the exact cause of irritable bowel syndrome or IBS. Ayurvedic science believes it occurs due to malfunction of digestive fire, which affects widely all digestive organs. In this condition, some triggers cause contractions of intestinal muscles, which causes flatulence, gas, cramps, bloating or diarrhea. Trikatu churna works when patient has diarrhea, cramps, bloating or gas associated with mucus in stool or if patient has sticky stools, then Trikatu powder is drug of choice in ayurveda. It normalizes the digestive fire and corrects its functions. It reduces mucus in the stools and helps almost all symptoms of IBS. Note: Trikatu churna should not be used when patient has some opposite symptoms such as hard stool and dry stools or constipation with hard stools. Trikatu itself has drying and warmth effect in the body, so it will not work in such case. For Best results, patient may also require some other medicines including Kutajadi vati, Kutajghan vati etc. In gout, patients have two types of pain experience. Some has pain with tenderness, redness and warmth on affected joints. In this case, Trikatu will not work. Trikatu churna works in gout when patient has following symptoms. All these symptoms are related to KAPHA dominant gout. Therefore, Trikatu reduces all of them and provides relief in pain. Trikatu churna is a great solution for pregnancy symptoms unless you have burning sensation or acid dyspepsia. It increases appetite, reduces feeling of nausea in pregnancy with dosage 125 mg to 250 mg twice a day. The honey is best adjuvant in such cases. The dosage of Trikatu churna is 125 mg to 500 mg twice a day. If the dosage increases from one gram per day, it may cause heartburn or acidity. Therefore, we consider the maximum dosage of Trikatu powder is 1000 mg a day. However, Trikatu churna contains herbs and spices, which we use in our daily kitchen, but the excess intake can cause some unwanted effects. In the dosage less than 1 gram per day, it is safe to use. The most common side effect of Trikatu is heartburn and acidity. The excess dosage may cause following side effects. Trikatu powder is beneficial in pregnancy as well as in breastfeeding. It is SAFE in dosage of 500 mg per day in pregnancy and 1000 mg per day in lactation. The larger dosage may be UNSAFE. Therefore, the maximum dosage should not exceed from 500 mg per day in pregnancy and 1000 mg in breastfeeding. The larger dosage in pregnancy may trigger miscarriage, spotting or bleeding. Can we take Trikatu and Triphala Together? Yes, Trikatu and Triphala can be taken together. This combination is normally found in many ayurvedic formulations. Trikatu ingredients increases bioavailability of medicines and Triphala ingredients helps in elimination of toxins from the body. You will found many ayurvedic formulations contain these six ingredients together, which increases the efficacy and safety of medicines. What should I do if Trikatu is causing burning sensation? In such case, Trikatu should be stopped for a few days and treatment should be given for burning sensation, heartburn and gastritis. After that, Trikatu can be re-started, but in the dosage of about 125 mg twice daily. The dosage should be increased gradually.